I went scuffing around in the woods today, listening to the crackle of dry leaves … the last of the birdsong. And I don’t know why, but something led me to a clearing I haven’t set foot in for a long time. 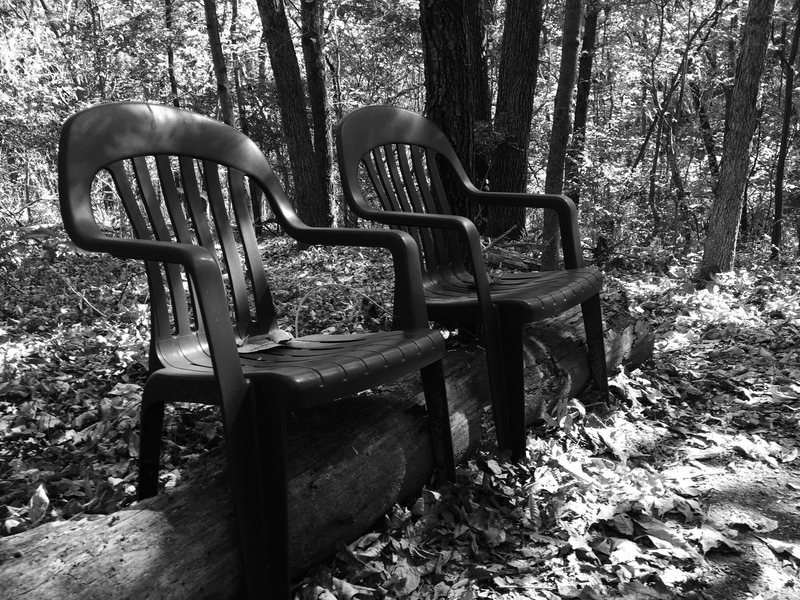 A year ago, I discovered two white chairs here, resting side by side. Inviting me in. Today, the chairs are still there, albeit in a different color. I’ve been thinking, since my anniversary post yesterday, about how full and rich my life seems these days. Which is not the same thing as saying that my life is perfect, or clean, or that it makes sense. But full feels better than empty, and I’ll tell you: lately, my cup runneth over. That said, I want you to know something: there is still space in this second chair for you. My WordPress app tells me that I’ve had 3,079 visitors since I began writing here, and to me — a girl who’s allergic to Benadryl, angora wool, and any and all forms of self-promotion — that number is just plain astounding. But you know what would be *more* astounding? If I could get to know even ten of you just a little better. We can tuck our knees up under us, curl our hands around two cups of steaming-hot coffee, and just talk — here in this frosted clearing, while the yellow leaves float down slow. If you’ve never reached out to me before, I would love — sincerely — to hear from you. My email address is akwilsonfellers@gmail.com. Let’s tip our heads back to the blue sky and laugh. Let’s learn something about each other. And then let’s see where we’re sitting, 365 days from now. I love where you are taking this post. The set up is incredibly beautiful!